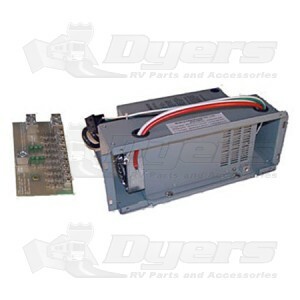 WF-8955REP models make it easy to replace certain brands of converters with removable converter section. Converter output 55 Amps DC, DC fuse board included. bracket to make installation easy. A new DC Fuse Board is also included. The WF- 8900REP provides all of the WFCO’s performance standards: quiet operation, filtered power, overload protection, short circuit protection and FCC Class B approval. Quiet operation is assured as the cooling fan only runs when needed. Automatic three stage battery charging maintains your battery’s life with three nominal voltage output modes:13.2 Vdc range “float”mode, 13.6 Vdc range“absorption” mode and 14.4 Vdc range “bulk” mode. The converter is protected against over temperature and reverse battery connection.The WF- 8900REP is FCC Class B compliant.This means that the converter is deigned not to cause interference with televisions, radio or other signals. Received promptly exactly as ordered.